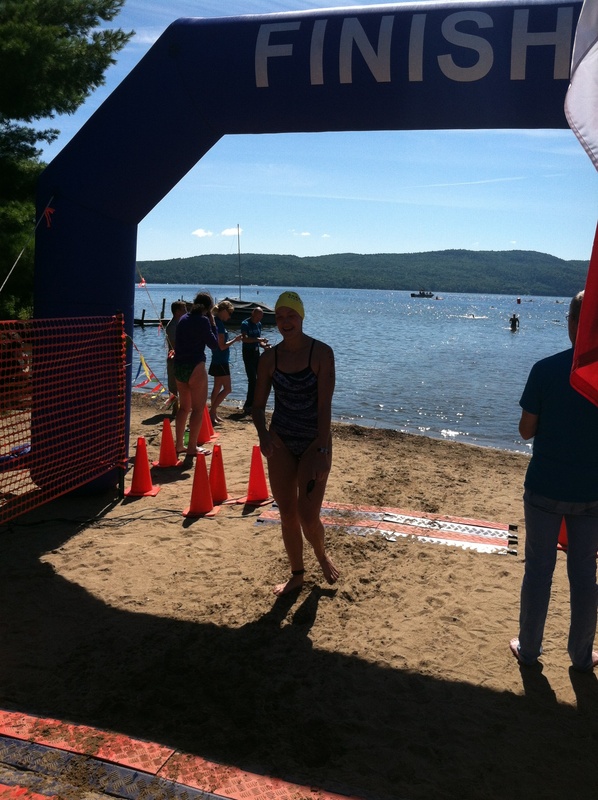 Allow me to gush: I had SO MUCH FUN at the Lake George Open Water Swim 5K last weekend! My 5K race at 9:30 a.m. Saturday was one of four open-water races held throughout the weekend, ranging from 2.5K to 10K in length. Mine was fabulously well-organized, staffed by friendly, helpful volunteers. The weather was sunny and warm, and the water temperature was positively toasty, erasing all my worries about becoming borderline-hypothermic sans wetsuit in the allegedly-71-degree water (it must have been closer to 74). 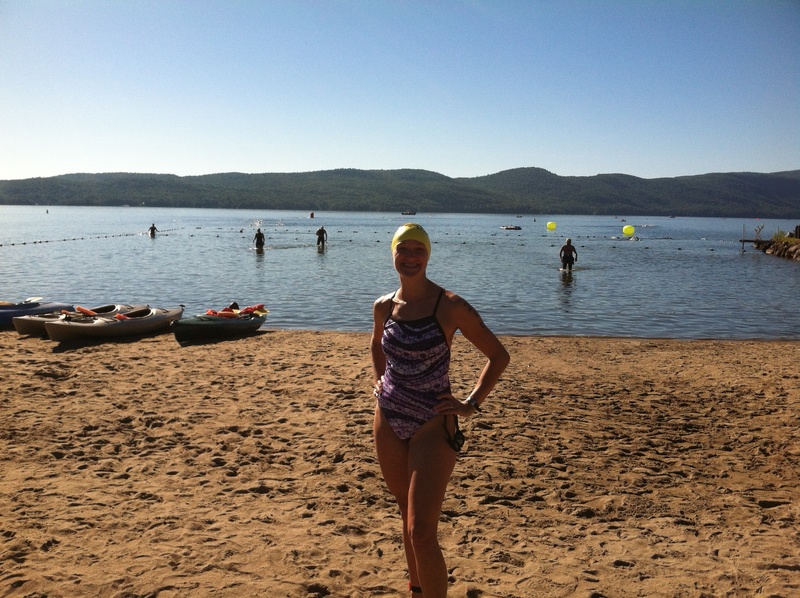 And the other swimmers were incredibly supportive—both my friends with the Saratoga Triathlon Club and the new friends I met while standing in line to check in (or, better yet, while drafting during the swim). And the lake! Oh, my goodness, the lake! I was dazzled by it from the moment we spotted the glittery blue water from the road, and that feeling only deepened when I walked into it to start the swim. Crystal-clear near the shoreline, seaglass green toward its center, the water alone is reason enough to do this swim. The start was relatively calm, despite the race organizer’s hilarious safety warning about it. “I guess I offended some triathletes in the last meeting when I talked about the start,” he said. “So I’ll just say: We’re all going to try to keep our flailing limbs to ourselves, but there will be some contact.” He paused, looking at the co-organizer. “Was that better?” he said. I was impressed to note how quickly the lead pack took off. I tried in vain to catch a couple of the first pairs of heels, then thought: “Spoiler alert: Amy Reinink will not be the first one out of the water today.” I eventually settled in with a crowd of five or six other women, and swam in a fast, friendly pack with them for much of the first lap. Later, one of those women identified me on shore and told me I had a great swim. (This is what I mean when I talk about the new friends I made drafting!). The course itself was terrific. Oversize, well-positioned buoys and distinctive mountains in the distance made sighting a breeze on the two laps of the out-and-back, diamond-shaped course. The first stretch of the first lap was over almost before I knew it, in about 20 minutes—way ahead of my projected finish pace of 1:30 for the whole 5K. The second stretch of the first lap brought something unexpected: swells. They were just the amplified effect of boat wake, but the chop was significant enough to push me off course a few times. I was lucky to be in the center of the pack—I’m sure I would have done some crazy Ivans if not for the steady path of yellow caps in front of me. The chop subsided as we neared the shore again. That’s where the event turned into a race for me. The most recent issue of Runner’s World contains a piece with pithy pieces of advice from running coaches. Sage Rountree suggests being “lazy in the first half, stubborn in the second half” of a race, and I’ve been trying to enact that tip: Rather than making a mad dash to the finish line once it’s in sight, I’ve been trying to turn up the heat way ahead of time, after I pass the halfway point of a race. I had lost the pack of swimmers, but it didn’t matter. I’m pretty sure the first half of the second lap was my fastest, anyway, and I passed almost everyone I could spot. Then came the last half of the second lap. Holy moly, I was tired! I couldn’t spot any other swimmers in front of me or behind me, so it was just me against the rapidly increasing boat wake (who knew this could make a difference!?). It was one of those swims during which I seriously questioned whether I was moving forward at all. My arms ached like they were big, long bruises. I was so tired, I felt like I could take a nap. Finally—finally!—I spotted the shoreline. 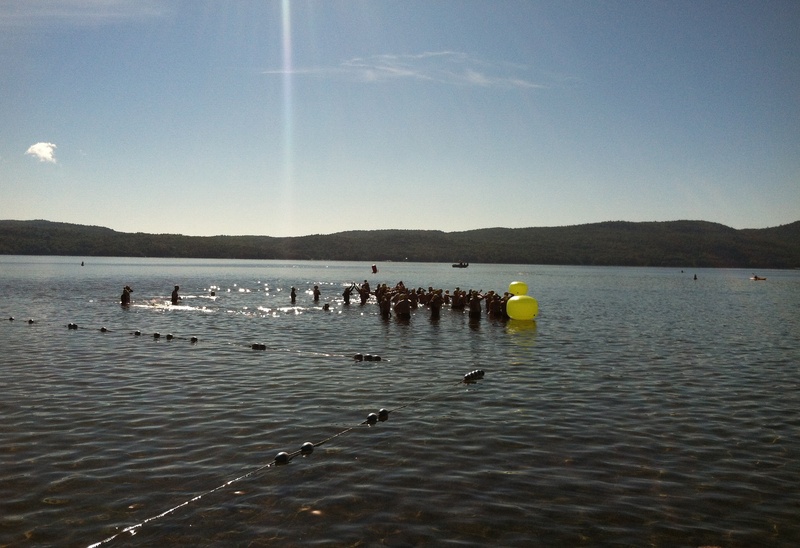 I made a beeline for the two green buoys we were instructed to swim between at the end of each lap. When I reached them, I was confused—why was the finish line over to the right? 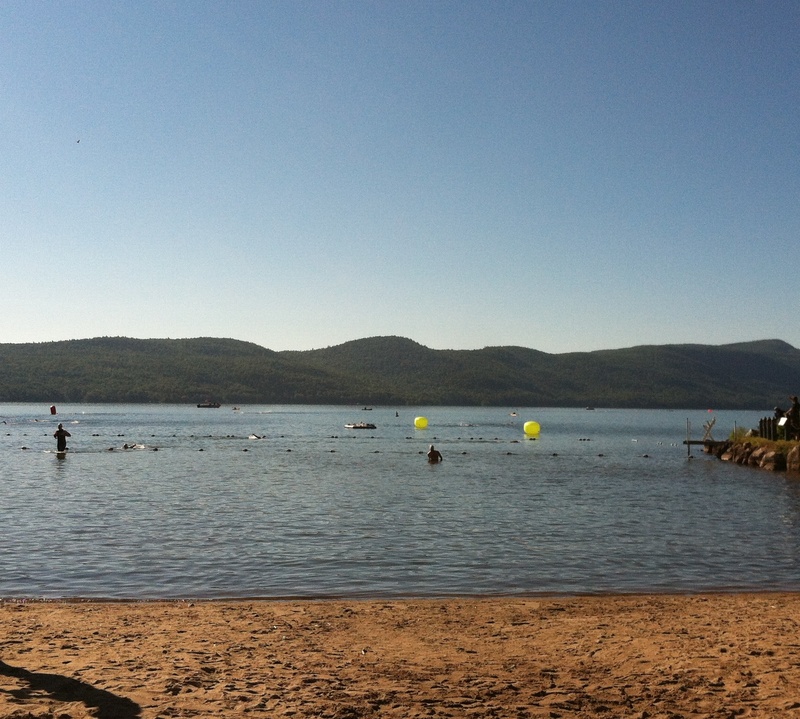 Why wasn’t anyone else at the green buoys?—until I realized that we were only supposed to swim through them at the turnaround, not at the finish. 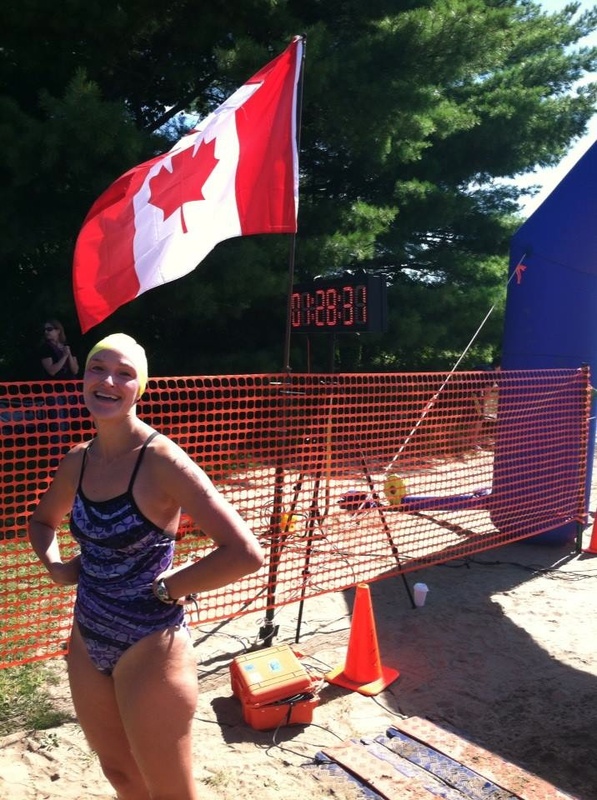 I angrily shifted course and swam to the finish line. The next few minutes were a mess. I stood up when my fingers touched the bottom twice, but then tried to swim again when I realized the finish line was still really, really far. I quickly stood up again after realizing it was far, but also shallow (this happens when you take an alternate route to the finish line). I feel lucky that I was too tired to experience any self-loathing, because it would have been thick (who misses the finish line!?!). I finished in 1:28:13—slightly faster than I expected, and slightly faster than my previous 5K swims in other venues. It was good enough for third in my age group. I’m proud of the award and the time. I’m more proud of the way I executed the race, without fear of bonking or hurting.